Unlike many killings which are usually related to robberies, jealousy and conflicts between business people, this case turned the spotlight on to a vicious dispute between a mother and son. Kamonchat Rattaphan, 51, is believed to be the mastermind behind the murder of Kanokphong whom she gave birth to 31 years ago. This presumption was almost dismissed by CSD investigators when they began the probe late last year after local officers were baffled in their quest to solve the murder that happened in Trang. Kanokphong was gunned down in Huai Yot district on the evening of Nov 21 last year. At first, nobody believed his mother was linked to his death. But this belief slowed progress at the beginning of the investigation until the chief of CSD’s subdivision 6 Pol Col Somphong Suwannaphong was assigned to conduct a probe and started to look into the theory. He, along with police inspector Krit Worathat, secretly traced the clues to avoid being noticed by the suspects. They gradually deleted unlikely assumptions from their lists. After this process of elimination, the pair decided there was only one motive that could have led to the killing of Kanokphong. That was a family rift with his mother, which seemed hardly possible as a motivation for the murder, but was the only clue left for the investigators to move on. Witnesses said Kanokphong and his mother had got involved in many quarrels, one so severe that “Kanokphong almost injured his mother with a knife, but luckily she escaped”, Pol Lt Col Krit said. The officers also found the two had been in a long, unsettled conflict over a plot of land left with the family by Kanokphong’s father who passed away. His mother Kamonchat, who later remarried, wanted to sell the land, but the plan was strongly opposed by Kanokphong. A check on mobile phone use by the mother and her son as well as other associates found Ms Kamonchat made phone calls to a group of men in Phatthalung, known as a “source of Otop hitmen". One Tambon One Product, or Otop, refers to state-promoted products sold in tambon (sub-districts) around the country. The phrase was borrowed for use in Phatthalung, which is notorious for its hitmen. “At this point, we began to believe the mother ordered the murder of her son because Phatthalung is a source of Otop hitmen,” Pol Lt Col Krit said. 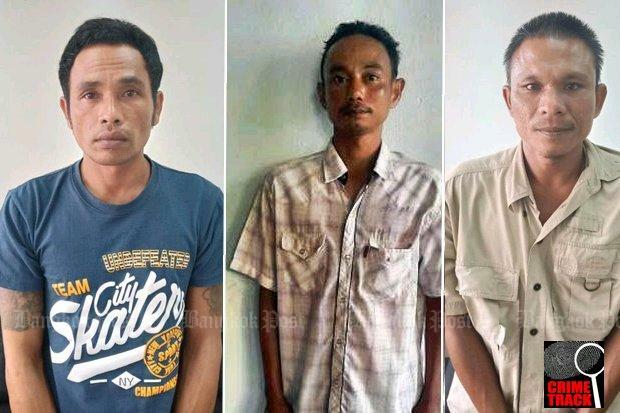 Further investigation found three accused gunmen – Narong Sitong, 45, Thanin Sonseni, 38 and Thawiphon Thawisuk, 38 – allegedly got involved. They, together with Ms Kamonchat and two other suspects, were nabbed last Tuesday (Jan 29).